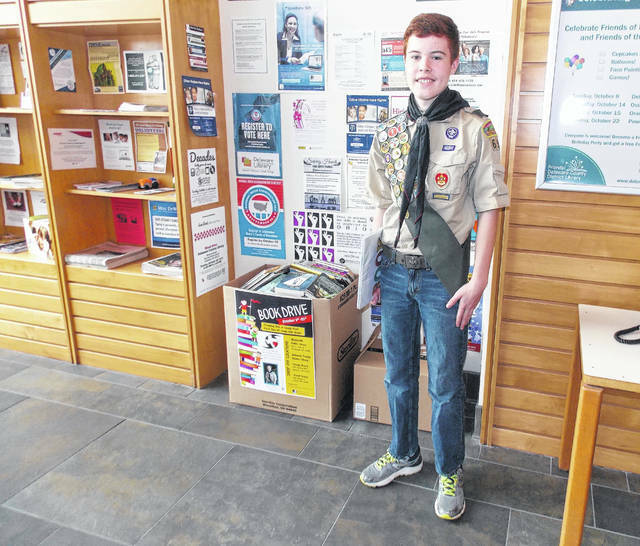 Heber Fuller, a freshman at Olentangy Orange High School, stands beside a book drive collection box at the Delaware County District Library Orange Branch, 7171 Gooding Blvd., Delaware. Fuller is collecting books for an elementary school in Texas that was ravaged by floodwaters from Hurricane Harvey. Olentangy Orange High School student Heber Fuller hopes to collect 13,000 books to send to Hull-Daisetta Elementary School, located northeast of Houston, Texas. The school’s 12,000 library books were destroyed by floodwaters during Hurricane Harvey. To find out how you can help Fuller reach his goal, email heber.fuller@gmail.com. When times get tough, books have a way of helping people escape from reality. For thousands of students across Texas affected by Hurricane Harvey, escaping into the pages of a fairy-tale world has been difficult since Mother Nature destroyed library after library. Heber Fuller, a freshman at Olentangy Orange High School, is doing his part to help put books back into the hands of 250 students at Hull-Daisetta Elementary School, located northeast of Houston. Holding the rank of Life Scout with Boy Scout Troop No. 696 in Westerville, Fuller said he was looking for an idea for a service project he could do as he pursues the rank of Eagle Scout when he stumbled across an article about an Arizona Boy Scout who conducted a book drive following Hurricane Katrina. Inspired by the success of the book drive in Arizona, Fuller decided to take on a similar project here in Delaware County. With help from his father, Chris, and information provided by the Texas Library Association about which schools were in need of help replenishing their libraries, Fuller said he decided Hull-Daisetta Elementary was most in need of help. For the entire month of October, Fuller is accepting gently used or new books for kids in grades pre-K through sixth. Students in the Olentangy Local School District can drop off books at Orange High School, Berkshire Middle School, or Walnut Creek Elementary, while public drop-off sites have been set up at the Orange and Powell branches of the Delaware County District Library, and at the Westerville Public Library. Fuller said since the book drive kicked off on Oct. 1, local churches have started collecting books, Half Price Books has pledged to donate, and Books For Bedtime — a nonprofit founded by a Bexley Middle School student — recently donated 1,500 books. Closer to home, Olentangy Superintendent Mark Raiff spoke of Fuller’s efforts during a board meeting earlier this month and pledged the district’s support. “We are examining all of our collections to see what we can add to the book drive,” he said. As of Tuesday afternoon, Fuller has collected 3,657 books, many of which are brand new. “I’m hoping to collect 13,000 books,” he said. To help deliver the boxes of donated books to Texas, the Fullers are working with shipping companies to see if any of them would be interested in donating their services. For more information about the book drive, email heber.fuller@gmail.com.